Find Out Which of the World’s Volcanoes are Erupting Today, Today! What do Hawaii, Yellowstone National Park and the Louisville Seamount Trail all have in common? Seafloor drilling is quite a technological feat, as I can now attest from first hand experience. In today’s blog, I will show you a bit of the technology employed to collect samples for the scientists on Leg 330. Depending on the composition of the seafloor being drilled, different kinds of drill bits are used. The drill bit is the part of the rig in direct contact with the seafloor, doing the cutting. 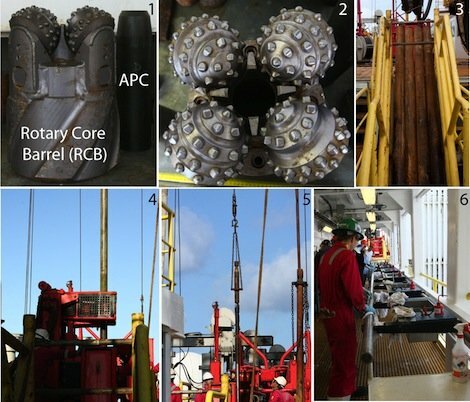 On IODP Leg 330, we are using a Rotary Core Barrel unit (panel 1). This is commonly used when drilling into hard rock seafloor, as we are doing on this cruise. You can see the business end of the drill bit in panel 2- it rarely meets a rock it doesn’t want to drill! This drill works by rotating the entire drill string (more about that in a minute- it’s the link between the ship and the seafloor), which in turn causes the rotors on the bit to turn and grind the rock. For comparison, in panel 1 there is also an Advanced Piston Core (APC) bit. This bit is used to drill deep into sediments, as they did on Leg 329 before us. That drill bit works like a cookie cutter; the bit is forced into the sediment very quickly, without rotating. However, an APC drill bit is not strong enough to effectively drill rocks, and it crumbles when it comes into contact with hard rock (basalt). The drill bit goes on the end of a series of pipes (panel 3), which are strung together for thousands of meters (we are currently in nearly 2000 meters of water) until it reaches the bottom of the ocean. All those pipes together are called the "drill string." Panel 4 shows the instrument, affectionately known as Bigfoot, which screws the many barrels together into the drill string. At the bottom of the drill string, on the inside of the pipes, is a plastic core liner that is 9 meters long. It collects the rock as it passes through the drill bit. After the drill bit has advanced about 9 meters and the core liner is full, a wire is dropped down through the drill string that grabs onto the core barrel at the bottom of the drill string. The wire, now attached to the core liner, is then retrieved and pulled back onto the deck (panel 5), where the ship’s technicians pull out the core liner. The area of the ship seen in panel 6 is called the catwalk. This is where the fresh core liner is placed and wiped down and where the scientists can get their first glimpse of what samples have just been collected. It’s a very exciting process! Obviously, this is a very brief description of how the entire process works, but I hope it makes clear the basic ideas behind how we collect our subseafloor samples. We started collecting cores a few days ago and I’ve been hard at work processing sediments and rocks with which I search for microbes. Next time around I’ll show you my lab space on the ship and you’ll understand why even though the ship is in the tropics, I still need a heavy jacket to do some of my work. While your here, if you haven’t yet looked at the other blogs, I encourage you to do so. Becky Williams gives a geologists perspective to what we are doing on Leg 330 and our two educators, Kevin Kurz and Lisa Strong cover life on the ship and some of the science behind what brought us to the Louisville Seamount Chain. As a matter of fact, if I had read Becky’s blog sooner, I would have known she already talked about how drilling works, but this fills in some different details, so hopefully you will understand it better by reading both our explanations!